The King Gillette Ranch, Calabasas, Calif.
Our grandfathers knew one of the wealthiest men in America rather intimately – every time they opened a packet of disposable razor blades, there he was, on the wrapper. And his name was really King. In 1926, he bought the 360-acre Stokes Ranch in the heart of the Malibu Creek Watershed. Gillette built several homes here, most notably the 1928-1929 Wallace Neff designed Spanish Colonial Revival house, Neff’s masterpiece of the pre-War era. But Gillette was only one owner to make his mark on the landscape. Please join us as a cultural anthropologist from the National Park Service gives us a behind-the-scenes tour of the recently-acquired King Gillette Ranch in the Santa Monica Mountains. 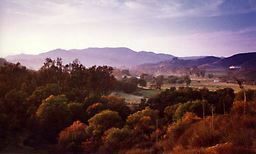 One of the most stunning locales in the Santa Monica Mountains, the biologically diverse parkland contains broad meadows and low ridgelines, valley and coast live oak savannah, grassland, coastal sage scrub, chaparral, and riparian woodland.